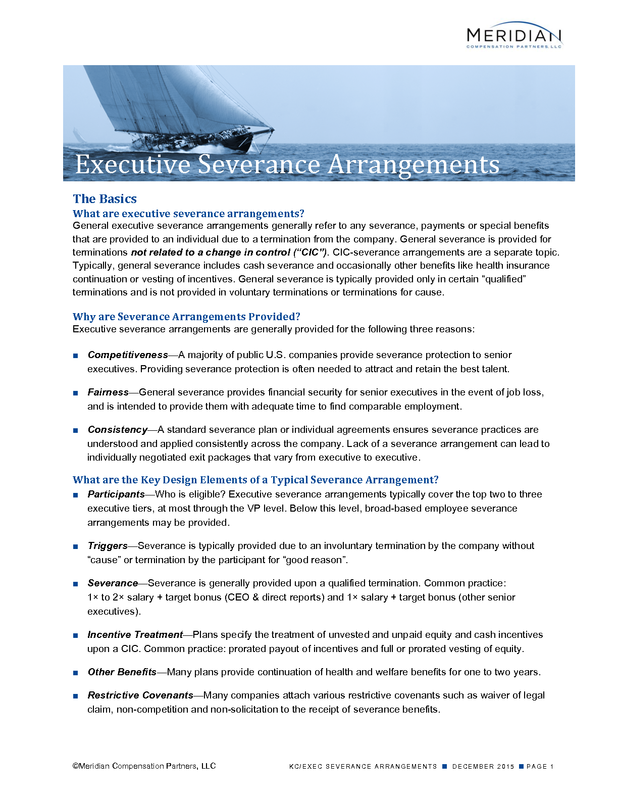 Looking at how and why severance arrangements are used in executive compensation. What are executive severance arrangements? General executive severance arrangements generally refer to any severance, payments or special benefits that are provided to an individual due to a termination from the company. General severance is provided for terminations not related to a change in control (“CIC”). CIC-severance arrangements are a separate topic. Typically, general severance includes cash severance and occasionally other benefits like health insurance continuation or vesting of incentives. General severance is typically provided only in certain “qualified” terminations and is not provided in voluntary terminations or terminations for cause. Why are Severance Arrangements Provided? Competitiveness—A majority of public U.S. companies provide severance protection to senior executives. Providing severance protection is often needed to attract and retain the best talent. Fairness—General severance provides financial security for senior executives in the event of job loss, and is intended to provide them with adequate time to find comparable employment. Consistency—A standard severance plan or individual agreements ensures severance practices are understood and applied consistently across the company. Lack of a severance arrangement can lead to individually negotiated exit packages that vary from executive to executive. What are the Key Design Elements of a Typical Severance Arrangement? Participants—Who is eligible? Executive severance arrangements typically cover the top two to three executive tiers, at most through the VP level. Below this level, broad-based employee severance arrangements may be provided. Triggers—Severance is typically provided due to an involuntary termination by the company without “cause” or termination by the participant for “good reason”. 1× to 2× salary + target bonus (CEO & direct reports) and 1× salary + target bonus (other senior executives). Incentive Treatment—Plans specify the treatment of unvested and unpaid equity and cash incentives upon a CIC. Common practice: prorated payout of incentives and full or prorated vesting of equity. Other Benefits—Many plans provide continuation of health and welfare benefits for one to two years. Restrictive Covenants—Many companies attach various restrictive covenants such as waiver of legal claim, non-competition and non-solicitation to the receipt of severance benefits. Involuntary termination without Cause—If an executive is involuntarily terminated without cause, severance is typically provided. Cause is typically defined as conviction of a felony or financial fraud, although some companies have added items such as a violation of the company code of ethics or poor performance to the definition of Cause. Given the high standard of Cause, few terminations are due to Cause. Voluntary termination for Good Reason—Many executive severance arrangements allow for a voluntary termination by the executive if they have Good Reason. Good Reason is often defined to include: a material diminution of duties or authority, a requirement to relocate more than 50 miles from the current place of employment or a significant reduction in pay. While Good Reason definitions are common, many companies will provide only a limited Good Reason definition to afford greater flexibility to the company. Severance is typically expressed as a multiple of “pay”, with “pay” most often defined as salary and target bonus. Some companies will use a different bonus determination, such as an average of recent actual bonuses. Many companies will have various tiers of participants with varying severance multiples for each tier. A multiple of 1× to 2× pay is common for the highest tier with the CEO having a 3× multiple approximately 10% of the time. Occasionally the lowest executive tiers will define “pay” as base salary only. Time-vested equity incentives such as stock options and restricted shares may vest pro rata or vest fully upon a triggering event. However, 40%–60% of companies will forfeit unvested equity (both time-based and performance-based) in a termination. If performance-based stock or cash incentives vest upon a termination, the award’s value is most often determined based on actual performance through the entire performance period. Most companies provide for the continuation of health and welfare benefits for a period of time following a termination. Companies generally match the time period for continuation with the severance multiple (i.e., 2× = 24 months continuation). Some companies have moved to a fixed 12 or 18 months of continuation regardless of severance multiple. A small minority of companies will provide other benefits upon a termination, such as the crediting of additional age and service to a retirement plan or the continuation of perquisites post-termination.